Kauai was the first Hawaiian Island English explorer Capt. James Cook stumbled upon in 1778, while sailing from Tahiti toward North America. While it has long been believed that Cook was the first European to set foot in the Islands — he first did so at Waimea, on Kauai’s southwest coast — recent evidence has some historians claiming that Spanish sailors may have visited the Islands more than a century earlier. The oldest of the main Hawaiian Islands, it is believed the volcano that created Kauai first began erupting some 10 million years ago. Once rising more than 10,000 feet above sea level, Olokele Volcano has since eroded down to two main peaks — Waiʻaleʻale (5,148 feet) and Kawaikini (5,243 feet) — with the rest of the mountain sinking to form the crater that is home to Alakaʻi Swamp. Alakaʻi Swamp is the largest high-elevation swamp in the world and the starting point for Waimea River, the longest river in the Islands. 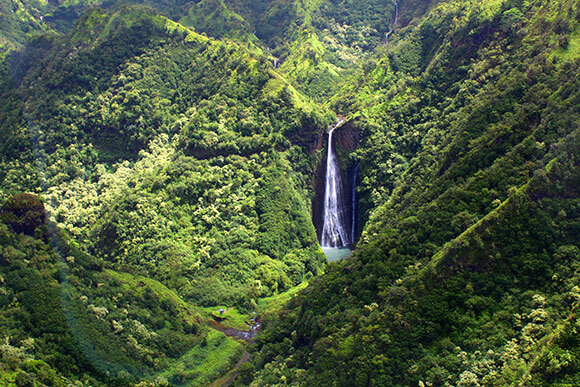 The 3,000-foot-deep Waimea Canyon, dubbed “The Grand Canyon of the Pacific,” is also the product of these erosive forces. Kauai’s age has also led to something of a geographic anomaly: Although it is one of the smallest of the main Hawaiian Islands, the forces of nature have had more time to break the island down and produce more sand beach around its 110-mile coastline than any other island in the chain. Meanwhile, it remains the least populated of Hawaii’s four counties (with roughly 56,000 permanent residents), and both development and tourism have been concentrated in relatively few locations. All of which furthers the sense that Kauai is, in fact, a separate kingdom. The average temperature at Lihuʻe Airport ranges between 70 and 80 degrees Fahrenheit year round. Kauai plays host to several major events each year, including the Waimea Town Celebration in February; the Prince Albert Music Festival in June; the Kauai Mokihana Festival in September; and Kokeʻe Museum’s Emalani Festival in October.